I cleaned up Orson Welles's early radio recordings then built a site to put them on. 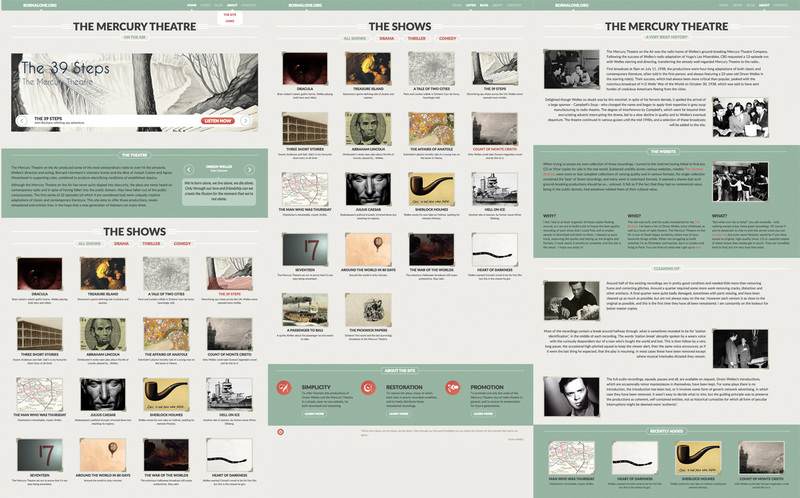 A personal project combining two of my favourite things (Orson Welles, radio drama) and one of my least favourite things (HTML) to create this website housing all surviving recordings of the Mercury Theatre on the Air. The Mercury Theatre on the Air was an amazing thing, bringing adaptations of mainly classic novels to the radio, with a cast, composer and director of unusual brilliance. Their performance of H. G. Welles's 'The War of the Worlds' is well-known, their others less so, and they have never been 'officially' released. They can be found scattered across the Internet but my goal with this site was to house them all in a single place where they could be easily found and downloaded.